The duffle coat is from the 19th century, and it gets its name from a town in Belgium that is the origin of the wool that makes the jacket. However, the design of the coat is from Poland, but historians credit the British Royal Navy with popularizing it during the world wars. 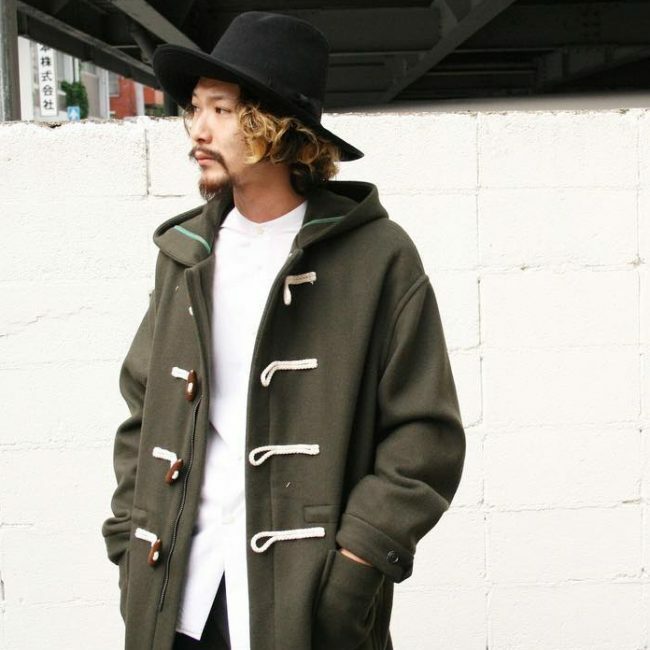 This coat has a unique design whose main characteristic is the hood and the horn toggle fastenings. It is a warm jacket, and this is what makes it a perfect clothing item for winter. However, it is also very fashionable, and most people do not just wear it to keep the cold at bay but also to look stylish. 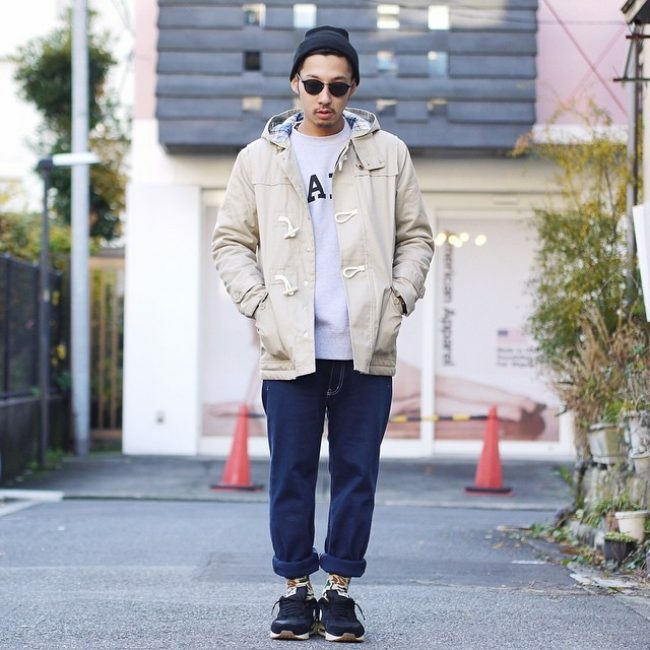 Here are some ideas on how you can rock the coat this coming winter. 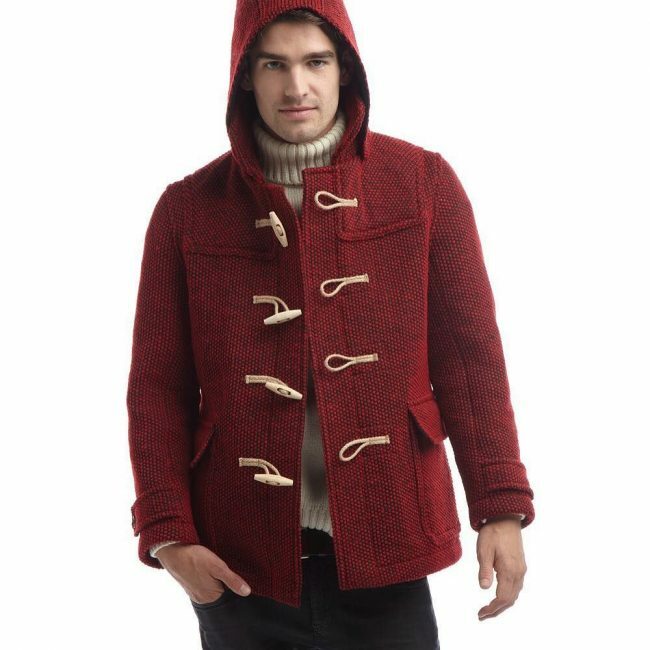 This red coat has what one can describe as a slim fit for a duffle, and it is short in length. The pattern of the wool is also fantastic, and it pairs very well with the turtleneck sweater to create a warm and stylish winter look. 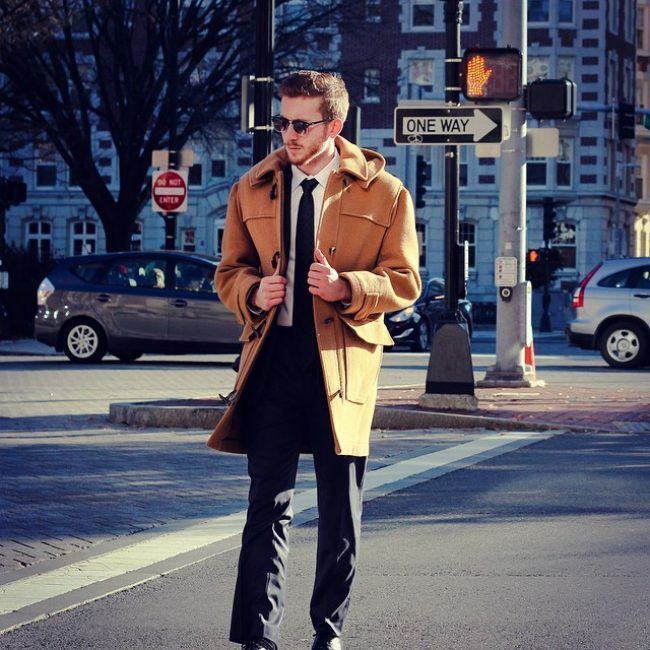 It is always about the color and fit when it comes to this type of coat. This one has a mid-length and beautiful navy blue color that gives it a formal look and hence making it a perfect choice for office wear. 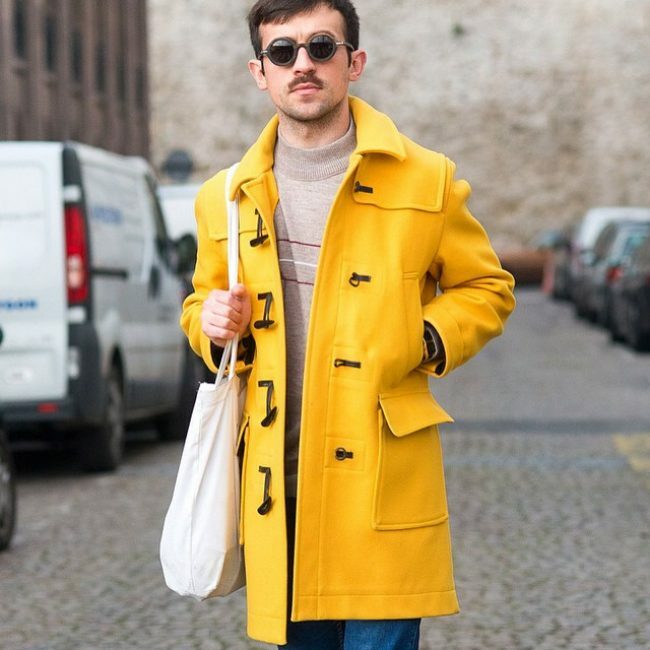 Bright colors are also ideal for coats and the mellow yellow on this one proves this. 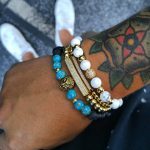 It can brighten a man’s overall appearance regardless of the color of any other clothes that he is wearing. You will hardly notice that it is winter with a coat like this one as it will always keep you warm. It is short in length and also very thick with an amazing green color and long collar. 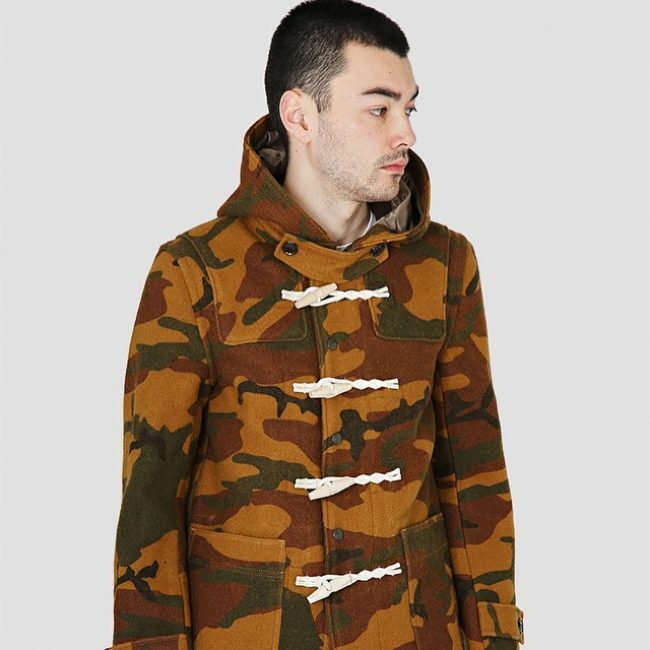 This coat is the kind that you would expect to see with British soldiers during the world wars. It has an overall bulky look, and it is also very long. However, the badges give it a modern and trendy touch. Orange is a fabulous color for a coat, and it makes this simple duffle look beautiful. It has a perfect fit, and it is short in length. 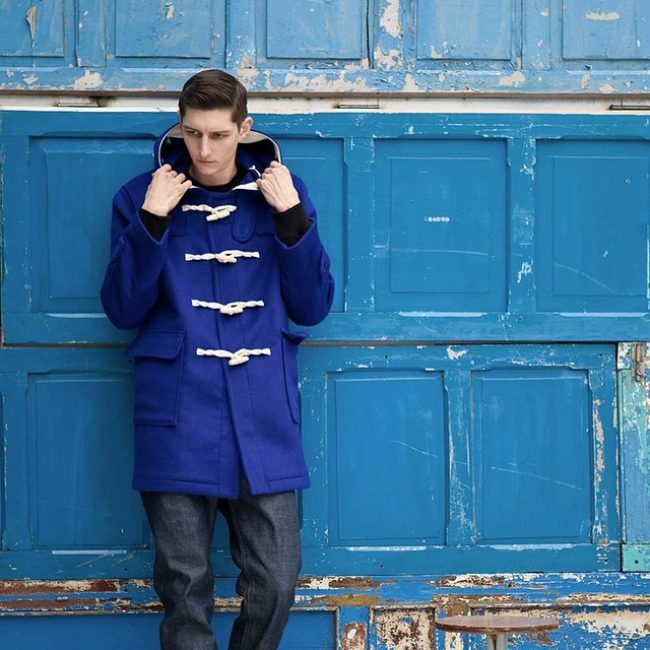 The duffle combines very well with the fade blue jeans to create an appealing winter look. In the past, the duffle coat was only of a particular type of wool, but in this modern times, cotton seems to be a good alternative. 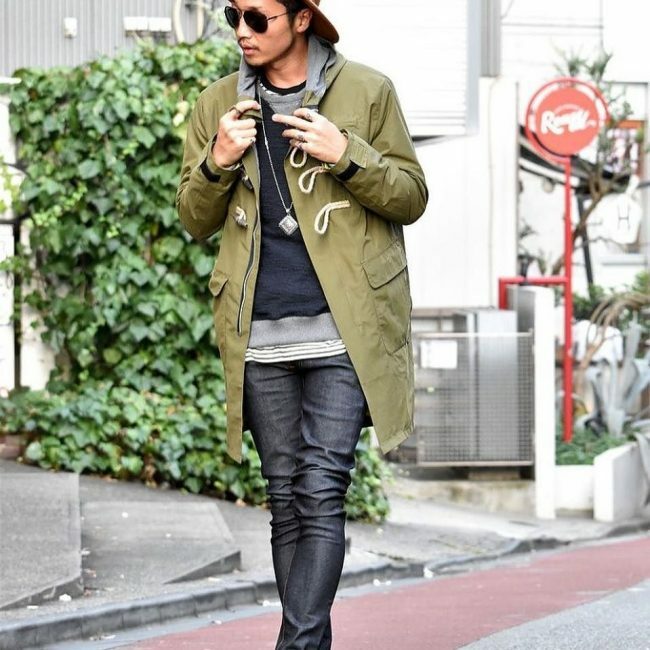 Apart from the unique material this long coat also has a beautiful army green color that adds to the uniqueness. There are many designs of the duffle to choose from, and this one is for men that do not like wearing hoods. 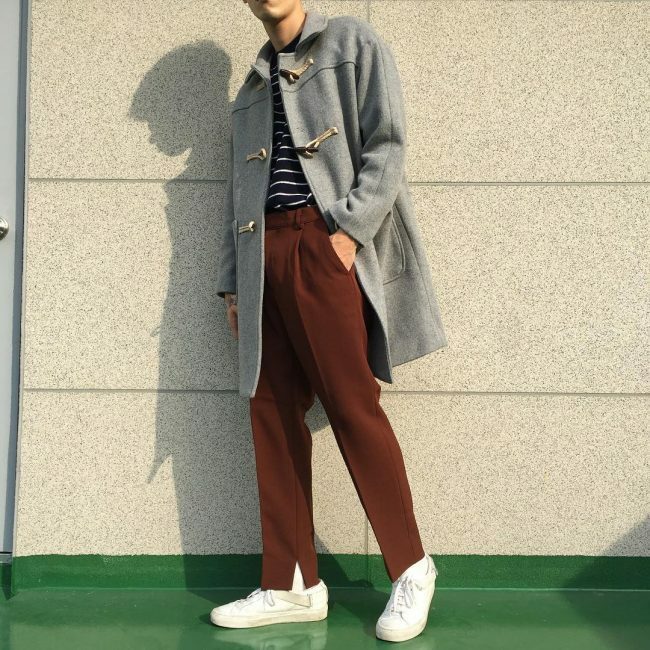 The long coat has a lovely gray shade and three loops and the wearer pairs it with a striped t-shirt and wide pants. The roll neck sweater and the cream pants are a perfect match but the four loop green duffle is the center of attraction on this look. It has a simple design and it is about knee length to ensure that it covers the important parts of the body during winter. A zip always comes in handy for a duffle coat because the toggles and loops are more for fashion than for keeping the coat closed. 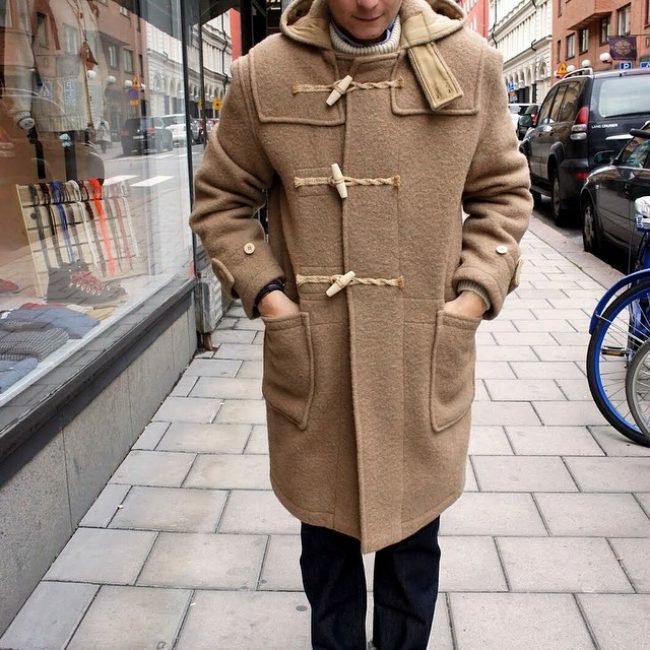 Apart from the zip this coat also has a beautiful neutral color that makes it perfect for a man. Collar button tabs are a functional part of the duffle but they also add to the beauty, and the one on this coat is extra-long. It has a neutral brown shade and three loops, and you should pair it with a turtleneck sweater. 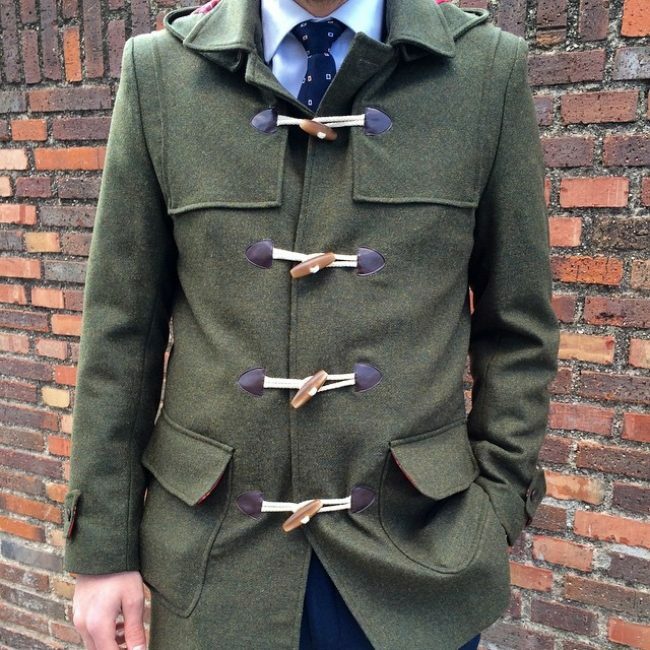 This coat has a lovely green color, but its British style design is what makes it look beautiful. 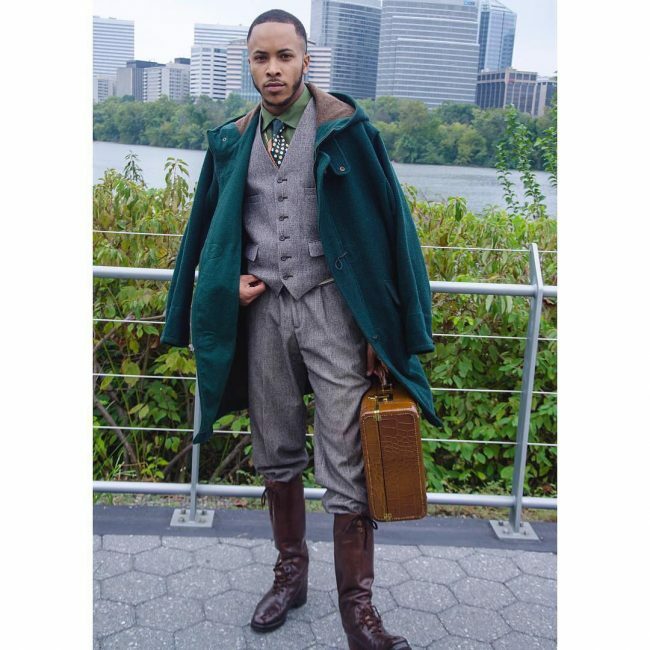 It pairs well with the waistcoat suit and the long boots to create a unique overall appearance. Most men tend to shy away from white coats as they are not always easy to keep clean. 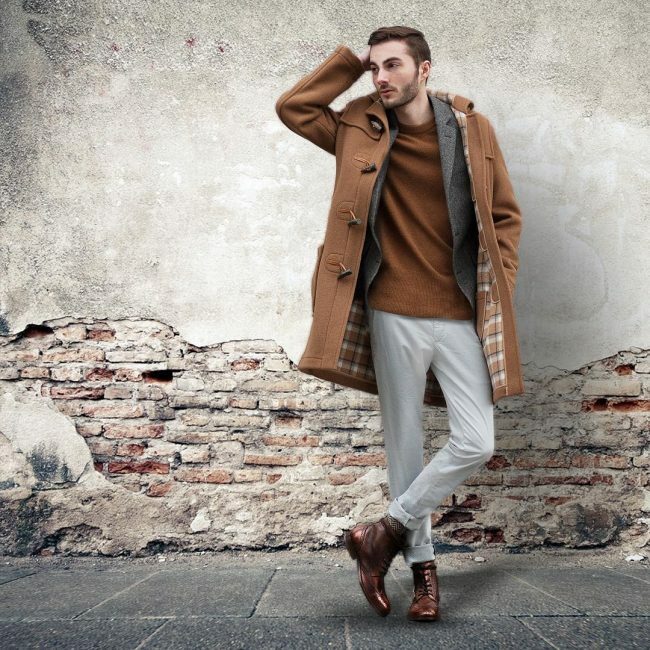 However, this long coat proves that white is also very fashionable and it pairs with a brown trouser and white sneakers to create a fresh look. 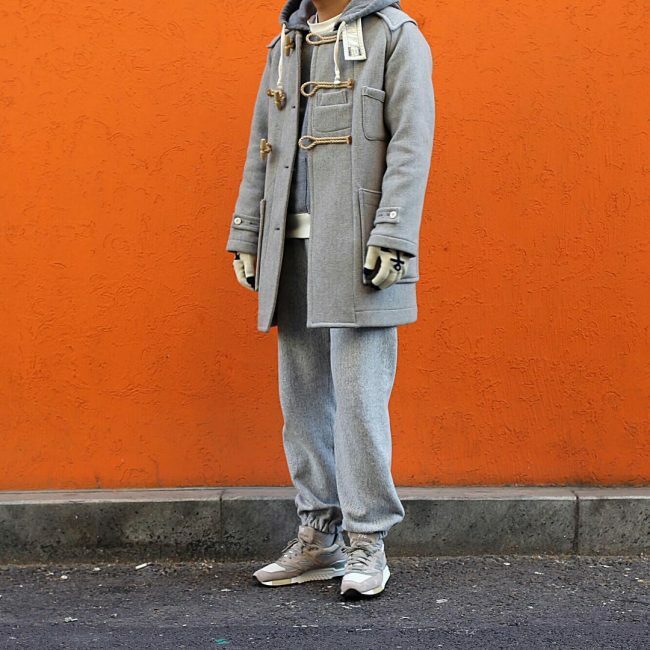 Although the overall appearance of this coat is a duffle, it is a combination of several jacket designs. The hands, for example, have an elastic band, and the pockets have a design that is different from the traditional duffle. However, the coat also has a nice checked material that makes it look fantastic. Choosing the right fit is vital if you want to look as adorable as this. Apart from the perfect fit the mid-length coat also has a lovely dark color that creates a beautiful contrast with the bright loops. Even without wearing this jacket you will know that it is super warm from its appearance. The long brown duffle coat also has a lovely brown color and a checked design on the inside that makes it look very trendy. 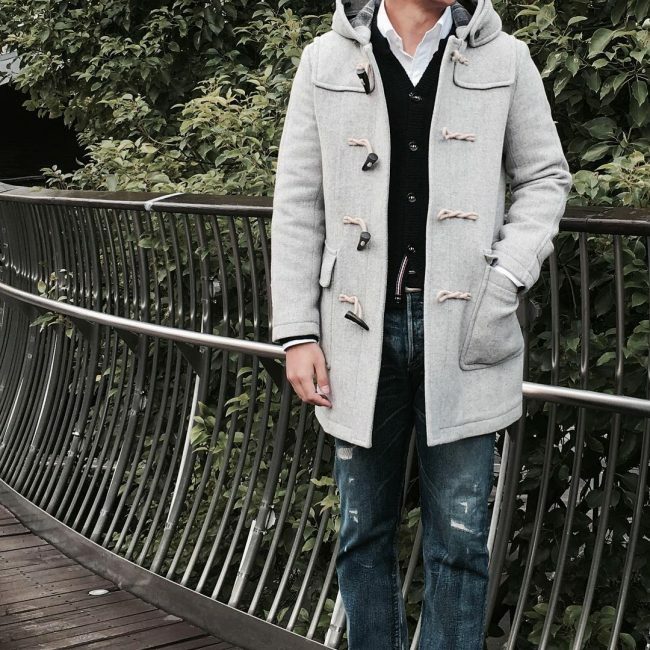 This long coat has a beautiful gray color that will go well or match with almost any attire that you wear. 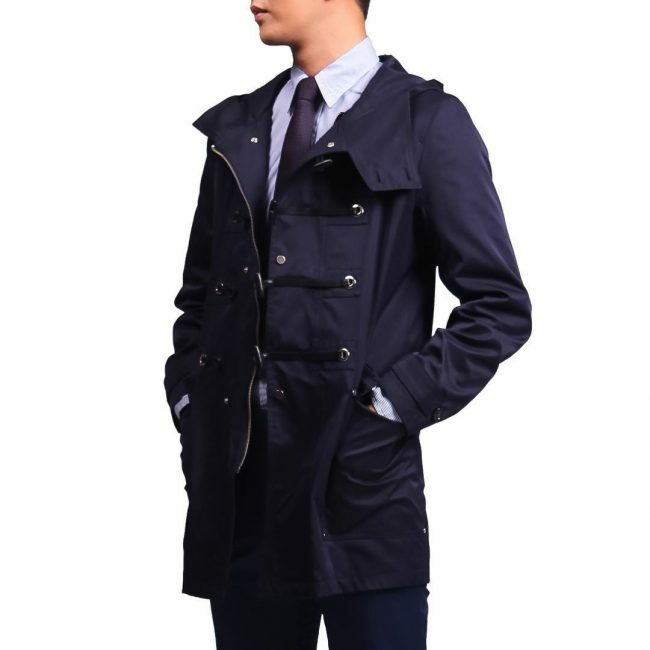 It has four loops and very straightforward design that makes it perfect for men that prefer simple looking coats. Beige is a neutral color, and so it is perfect for your duffle as you can pair it with any attire. 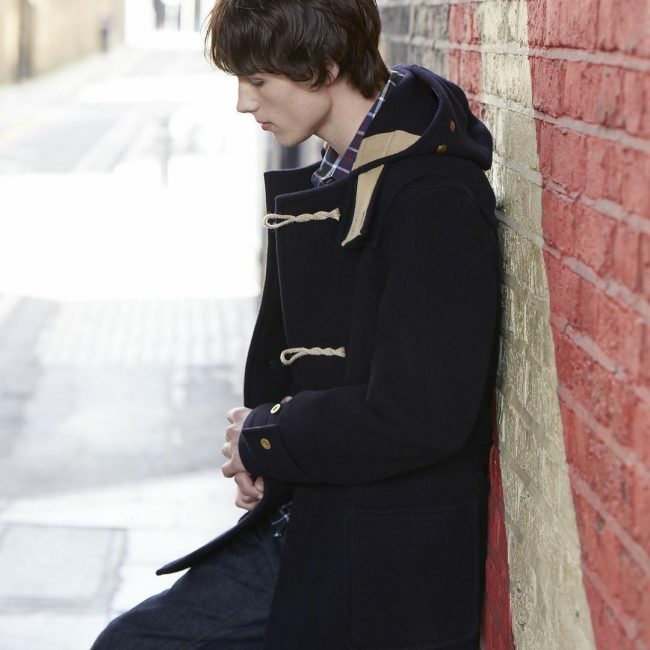 In this design, the beige coat combines very well with the black jeans and black shirt for a neat appearance. 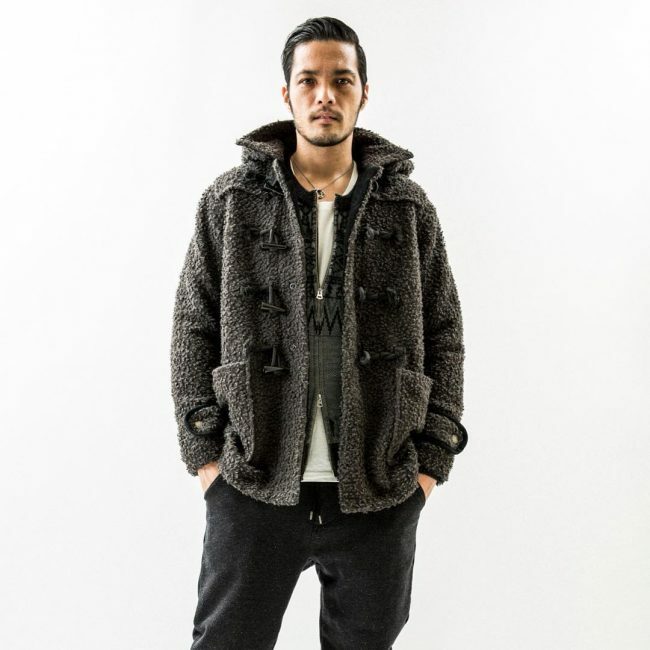 The polo bear cardigan combines well with the duffle to keep the cold out and to create a distinct and very appealing look. You can also throw in a scarf to add some style to the look. 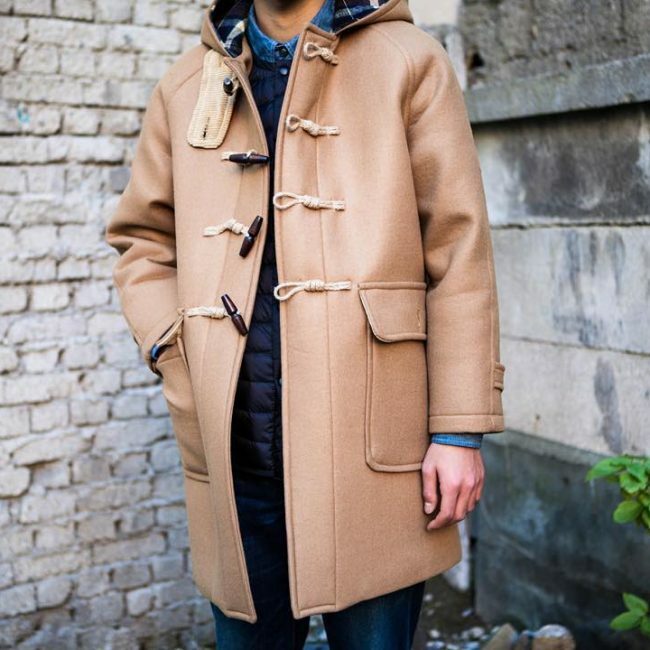 The duffle coat is timeless, and it has been around for a couple of centuries. This particular one has a vintage four loop look, a brown color and it also has the traditional hood style. Some multicolored stripes give this coat an impressive and modern look. However, it has an overall simple design that makes it perfect for men that do not like wearing jackets that are too attention-grabbing. 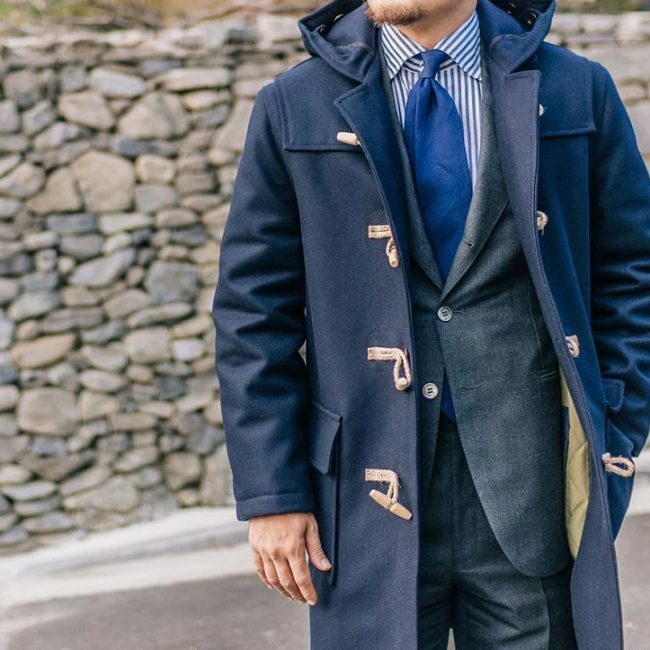 There is nothing too fancy about this coat except the lovely color but it will still keep a man warm and make him look stylish. The length and fit are also perfect as they allow you to wear other clothes inside. This look entails wearing three different colors, and for this, you need a black t-shirt, white pants, and a brown jacket. 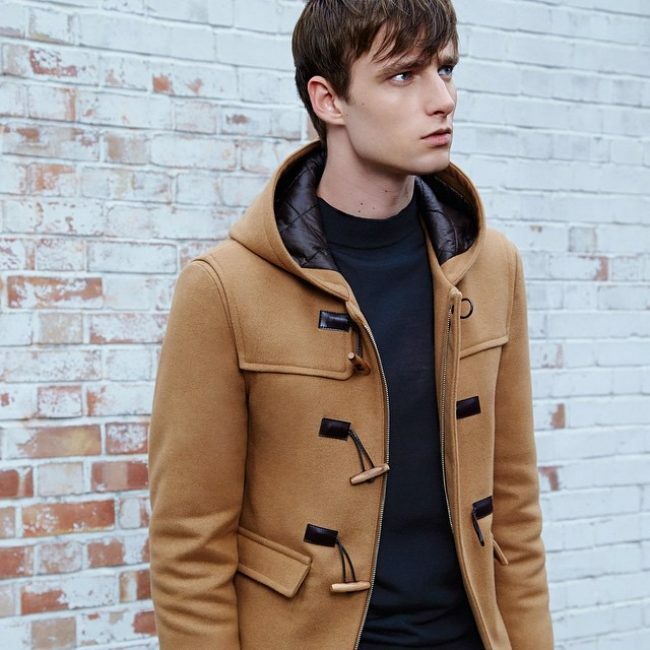 The brown duffle coat has a simple design with three toggles and loops. 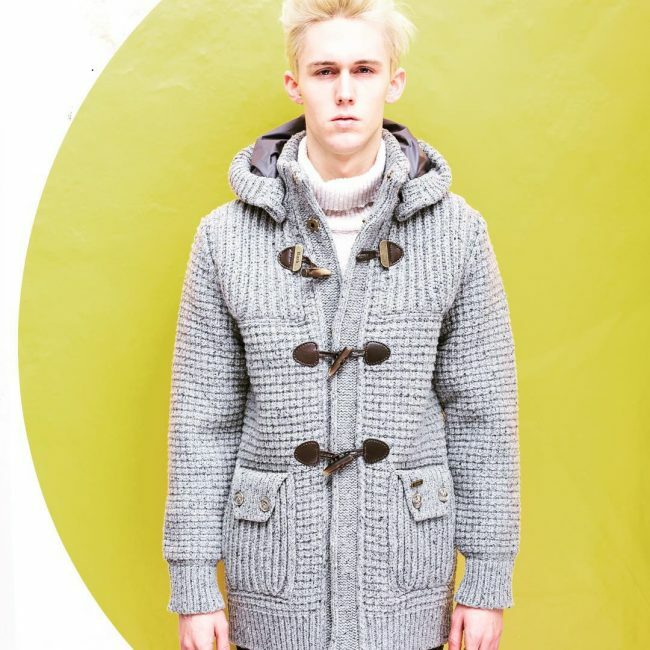 The mid-length gray jacket is the highlight of this design due to its unique design that involves having some oversize loops and an extra pocket at the top on one side. However, the gray pants and sweatshirt also help to create a beautiful all-gray look. White jackets always have a way of making men look neat and clean. The one on this design combines with a lovely sweater to brighten a gentleman’s appearance and also get him to look impeccable. The checked design of this convoy wool helps to create a unique coat that is both warm and very stylish. 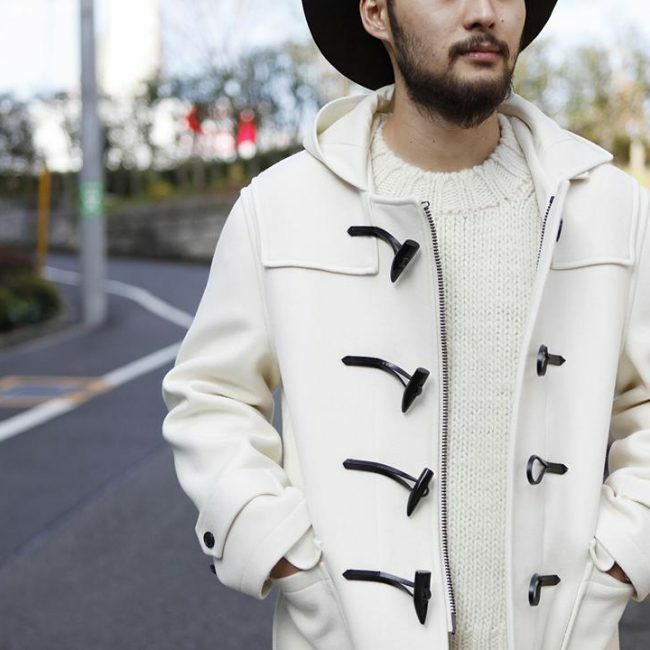 It has four big loops and toggles that add some style to the jacket, and you can wear it with any kinds of clothes. 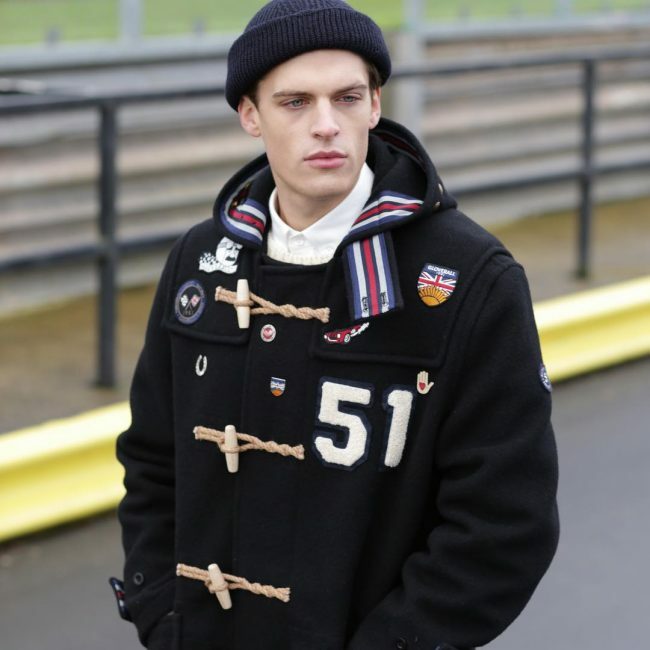 Gloverall coats were the in thing in the 50’s and 60’s, but you will still look trendy with a stylish one like this one. 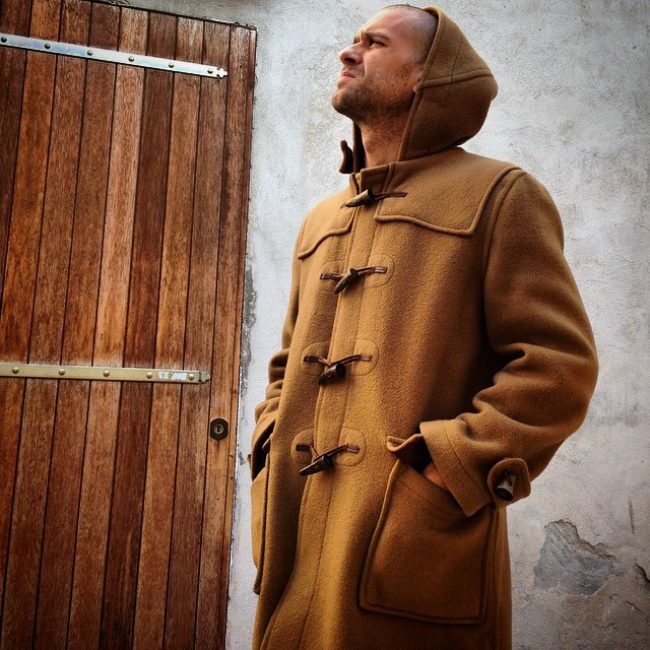 It a long jacket with a brown shade and three toggles and loops that give it an impressive design. 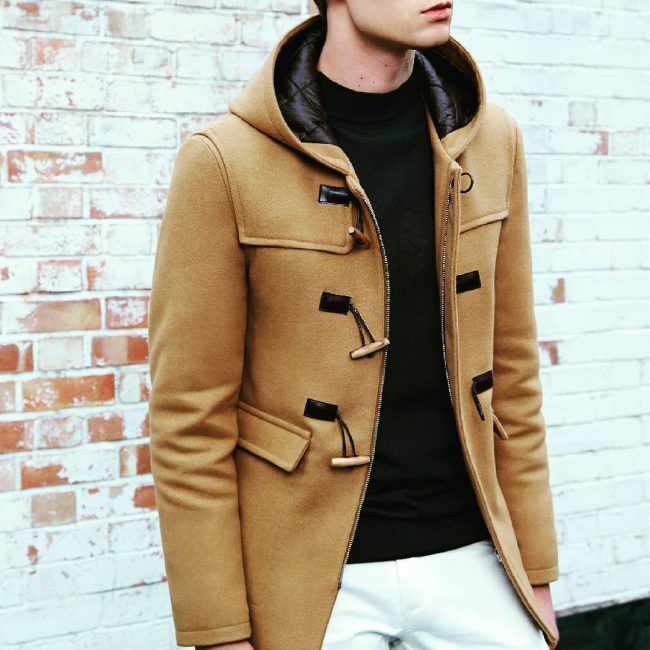 This flawless duffle coat is perfect for a modern man that prefers to wear a formal appearance. It is long enough, and it has a simple vintage design that works very well with the two-button suit style. Modern clothes are about creativity and trying out new things. 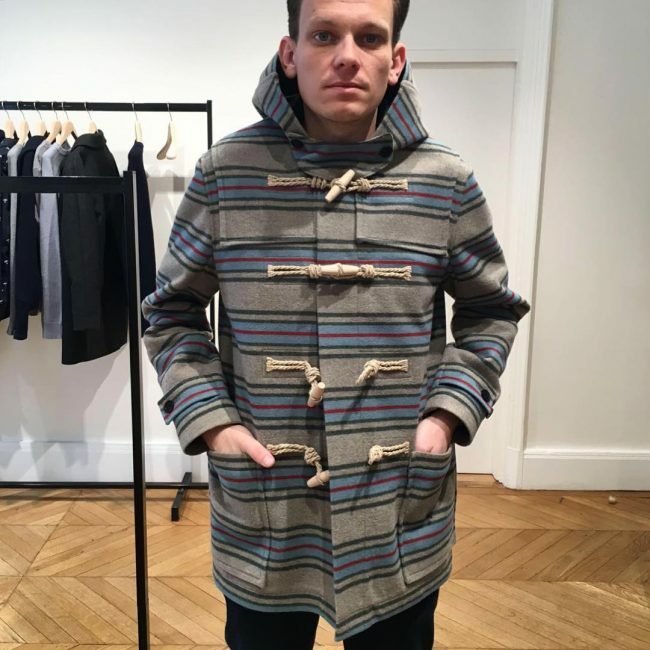 Although this is a duffle jacket it has a sweater material and design that makes it look unique and you will hardly see anybody else with a similar look. 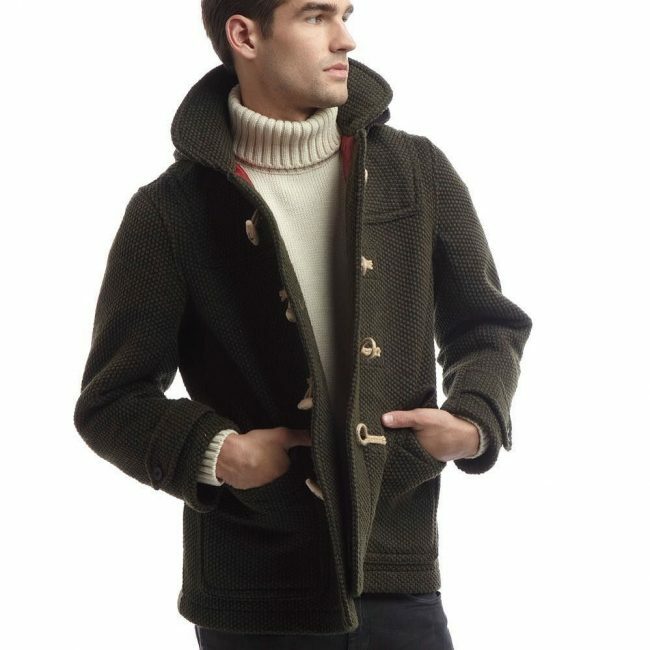 Here is another classic Gloverall jacket with an extra-long collar button tab and an overall official appearance. It has a beautiful brown color that makes it perfect for pairing with turtleneck sweaters and suits. 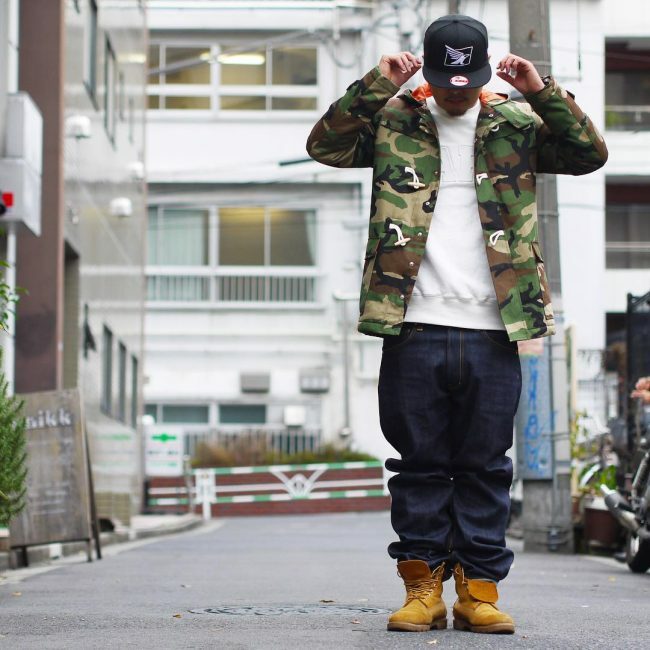 This short camouflage jacket is ideal for men that want something trendy and unique. It has a slim fit and three loops, and you should wear it with a white sweater and denim. The wooly look of this jacket is unique, and it is one of the things that make it a stylish coat. It has a loose fit, and it is short in length making it perfect for a casual look on a cold day. The relaxed feel of this jacket makes it ideal for the outdoors on a cold winter day. It has a beautiful gray shade and a medium fit that will look even more impressive if you pair it with some ripped jeans and a cardigan. 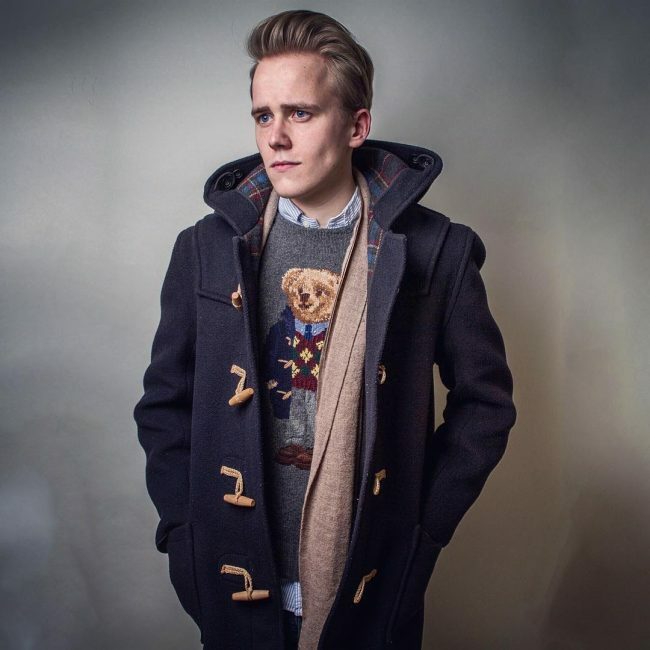 This jacket has both elements of a cardigan and a duffle due to its unique knitting. 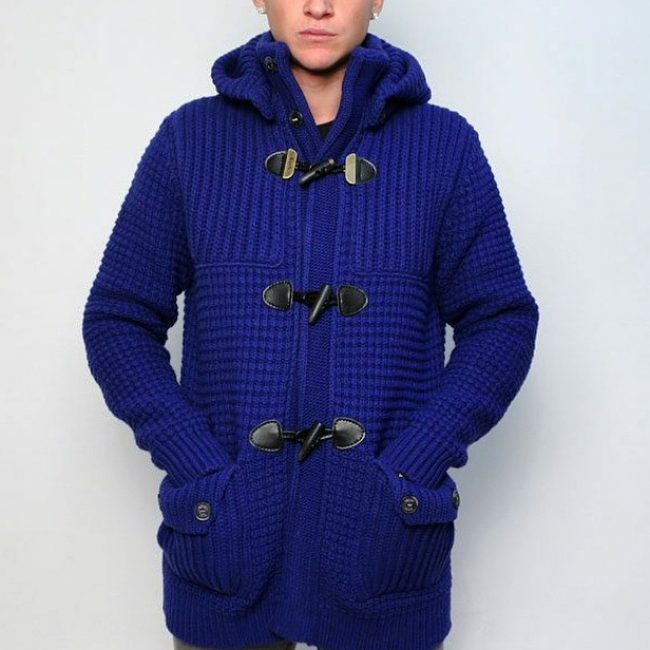 It also has a fantastic blue color and three toggles and loops that also help to enhance its appearance. Any man looking for something warm and stylish to fight the winter cold should try this jacket. Although it uses duffel wool, the knitting design is sweater-like, and it has some very smart pockets and some cute buttons below the toggles to make it easy to keep it closed. Everything from the slim fit to the length of this jacket is perfect. 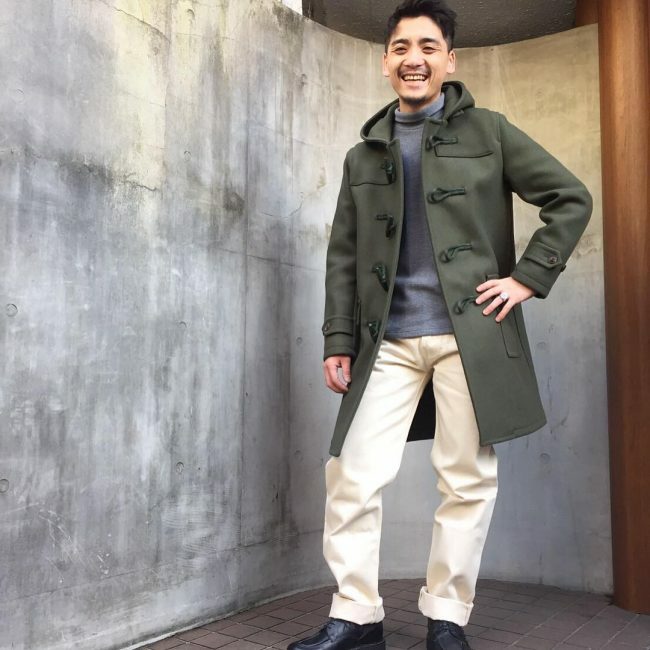 It also has a beautiful green color and some stylish pockets that make it a perfect coat for wearing on top of a suit. Although different men might have varying preferences when it comes to jackets few if at all any would say not to a chic one like this. It has an amazing color and a classic fit that means that it is not too tight and a red inner lining that you can see on the hood section. 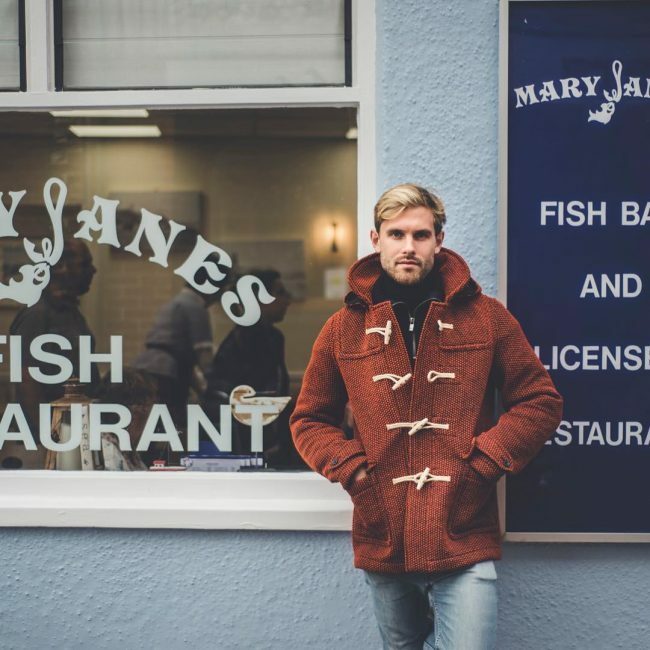 Most duffle jackets look amazing, and this is more so if they have a unique design like this fisherman style one. However, for yours to stand out from the rest you have to choose a distinct color and this royal blue is a perfect example of this. The camouflage print design on this jacket looks fantastic, but the high-quality wool is what makes it possible to create such a beautiful attire. Apart from this it also has a large open patch pocket with elegant stitch detail and vintage wooden toggles. Cotton is always a perfect alternative to wool, and in most places, it is cheaper, and so it is what people use to make the duffle jackets. However, they are still also beautiful, and this simple cream one with a checked inner lining proves this. This jacket has sleek sweater-like knitting that makes it look very adorable. It also mixes in a checked material on the chest area to add some detail to the overall gray color. 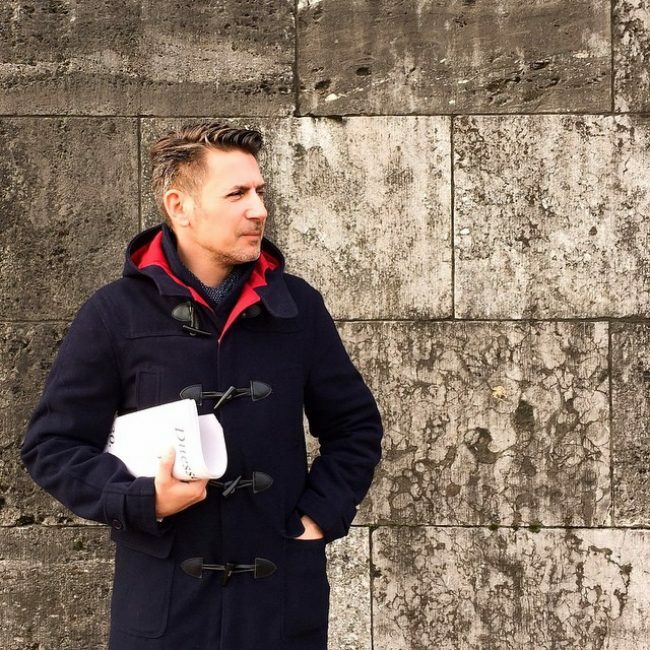 The jacket also has an excellent fit and some stylish pockets. A simple English style duffle like this one will still help keep the cold out while still giving you a stylish appearance. It has a beautiful dark blue shade and open patch pockets. 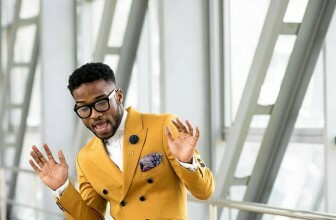 You have to choose your winter jacket carefully when wearing a suit to ensure that it enhances your overall appearance. This jacket is a perfect choice for men wearing suits as it has a formal look and the brown color and fit are also fantastic. The color and material of this jacket are what make it stand out because the knit design and pattern are very simple and it has some wooden toggles that also spice up its appearance. 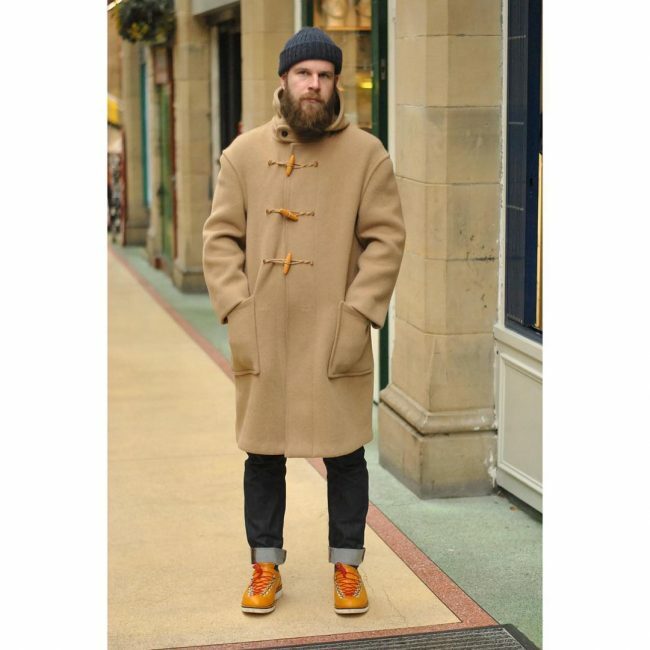 You can never go wrong with a Gloverall coat as it is timeless and will work for any man regardless of his tastes. This particular one is brown, and it has open patch pockets and a wooly appearance that makes it look extra charming. 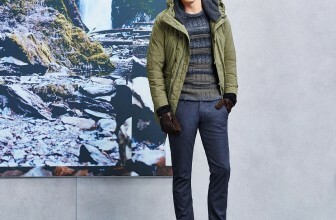 Even as you try to keep the winter cold at bay, you should never compromise on your appearance. 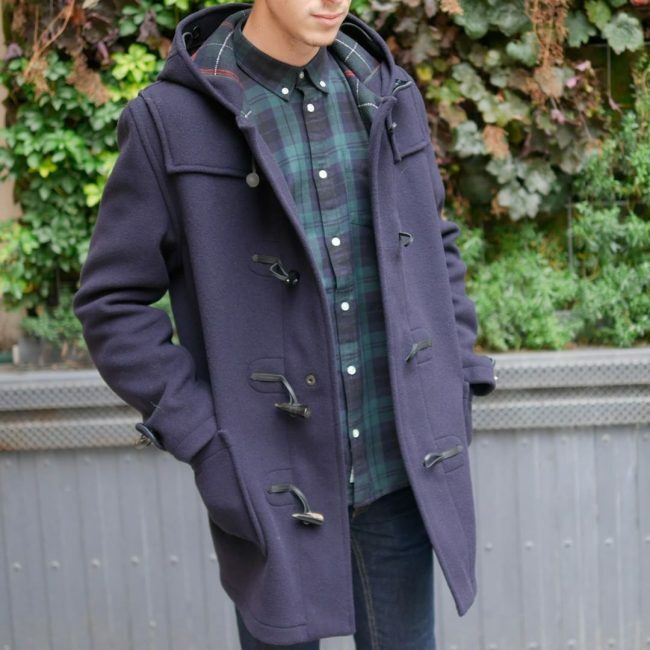 Instead of just wearing some old oversize jackets because they are warm you should go for a stylish duffle coat as it is both functional and stylish. Look through the designs above for some ideas but always make sure that you get the fit and length right as they are what makes the jacket look good on you. 45 Smart Double Breasted Suit Ideas – Bringing Back the Classics!